The Appian Way property, referred to as “Casa Siesta” was described as follows: “The two-story gem in its exquisite setting is a perfect Spanish vision made by master hands into a most livable and comfortable home. The unusual grounds take in a small lake to the right: you would have a ninety-foot front and a home of riotous beauty”. 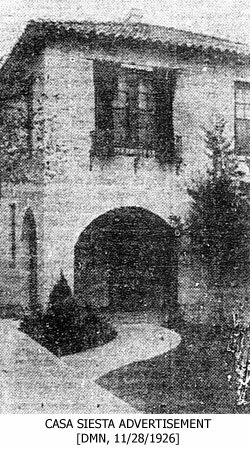 The previous year, on November 28, 1926 the Dallas Morning News had published an article titled "Temple Builds Unusual Home - Spanish Architecture is Used in Beckley Club House" (section IX, page 1). The article read: "One of the most unique of modern homes in Dallas recently was completed by S.A. Temple, developer of Beckley Club Addition in Oak Cliff. The place is called Casa Siesta, and is located at 127 Appian Way, in a setting that is unusually appropriate to its type of architecture. 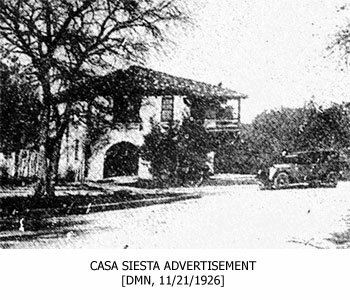 Casa Siesta is a nine-room, two-story brick residence, designed by Mr. Temple as one of several homes to be built in Beckley Club to emphasize the possibilities of the district, regarded by many as one of the most beautiful residential subdivisions in the city or the South. The motif is Spanish, but this is varied in some of the details for the sake of larger utility and comfort. The house sits at the end of an ornamental bridge over a lake, half of which belongs to the domain of Casa Siesta. It is surrounded by woodland, some of the trees growing within a few feet of the house. Paved streets open the vista in the immediate foreground and in both directions from the home, but its immediate environment is wholly rustic. The effect of rusticity is heightened by the lake, bounding the home on one side, and overlooked both by first and second floor balconies. This lake has been stocked with fish from the State hatcheries here and at night may be illuminated from floodlights on the outside of Casa Siesta. A private boat pier and diving boards supplement a walkway around the edge of the lake. The house itself has a number of unusual interior features. One of these is a duplication of wrought iron work in exterior balconies in the gates between living room and dining room and in the stair rails. The kitchen is decorated in orange and blue as a background for complete modern installations. Light fixtures are of special design, in the entrance corridor and living room being of wrought iron typifying Spanish galleons. Bath equipment includes showers in the basement as well as baths adjacent to the second floor bedrooms, which are three in number. Privacy for the tenant is insured through a wrought iron knocker of ancient design, with a grille in the front door through which visitors may be viewed before admittance. An unusual decorative effect is given to the front exterior in the use of outside window drapes of awning material in lieu of the usual awnings. A large garage is provided, access to it being along a paved driveway. All eyes rivet on the gay little balcony, bound about by variegated and highly colored railing. It looks down upon the owner's boat landing and across at the gorgeously painted tree-clad hills. An iron-railed veranda spreads below. One turns to the left to be invited within the welcoming arched portals. Casa Siesta fronts ninety feet on Appian Way and is reached via paved streets directly from the business district. All streets in the vicinity are paved, with the natural environment of wooded uplands being unexcelled in the city. Several other brick homes have been built in the neighborhood and Mr. Temple is planning further development through building of typical homes in various parts of Beckley Club. Visitors are invited to inspect Casa Siesta, the house being open upon request to the owner". In 1927 it was priced at $13,500 on "most reasonable terms".